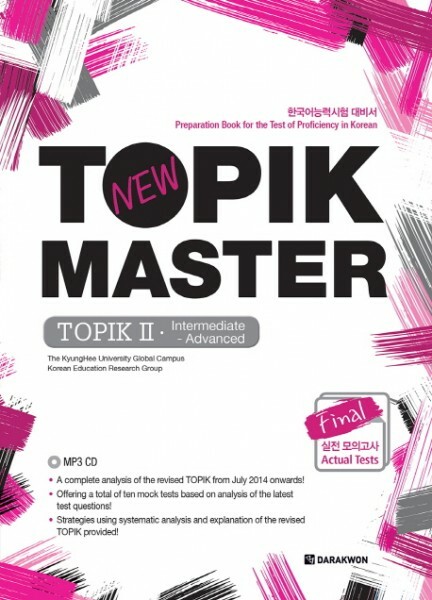 Produktinformationen "New TOPIK MASTER Final - TOPIK II Intermediate Advanced - mit MP3 CD"
The New TOPIK MASTER series revised with more thorough and detailed explanations and analyses New TOPIK MASTER Final Practice Test II: Intermediate - Advanced is a revised edition of New TOPIK MASTER Final Practice Test: Intermediate and TOPIK MASTER Final Test Practice: Advanced. This Korean-English edition is a prep book for the TOPIK II. The revised edition offers “Analyses of New Trend and Learning Strategy” section, showing the revised TOPIK question types and how to find answers in detail, to help learners find correct answer. After the10 sets of practice test, English translation is offered to explain the tests so that learners can study them as if taught by a teacher. The 3-step approach will help learners to effectively prepare for the actual TOPIK. Reports on the 2014 revised TOPIK and thorough reviews on previous TOPIK test papers are offered so that learners can be fully adapted to the new trend. English translation is offered for all texts, explanations and studying strategies so that English speaking learners can understand the contents more easily. Questions are largely grouped into certain types; they are then analyzed to suggest strategies to find the right answers so that learners can approach the test questions with greater ease. 10 sets of practice test based on the actual test trend will help learners train themselves sufficiently before they take the actual test, and get the best results. Weiterführende Links zu "New TOPIK MASTER Final - TOPIK II Intermediate Advanced - mit MP3 CD"
Kundenbewertungen für "New TOPIK MASTER Final - TOPIK II Intermediate Advanced - mit MP3 CD"